and former Superintendent Joseph Cipp Jr.
standards, the supplemental report dated March 5 says. who was hired by the district to investigate the matter. Black would not comment on the report Friday. if it is investigating. The State Department of Education did not respond to a request for comment. denied that he changed any student's grade or asked others to do so. Greg Guercio, the school district's attorney, said Friday, "The board of education now considers the matter closed regarding Mr. Cipp." to raise Sloan's marks. O'Connell has filed a wrongful-termination suit against the district in State Supreme Court. athletic scholarship and Cipp "must have been involved or must have known what was going on." atmosphere of pressure upon the administration and the teachers to make sure Ryan Sloan got the NCAA scholarship." that were not included in January's preliminary report. chance to attend Syracuse University. At that time, Cipp also was football coach, a position he held for more than three decades. boy and resolve it," attorney Richard Hamburger said Friday. "He wanted him to succeed. He wanted him to get the scholarship." Cipp told them, according to the report. The report says one teacher told Cipp that if Sloan "does everything right, he could get a B, but is more likely to have a C."
Cipp replied: "He needs a B." "It was clear that Mr. Cipp had specific expectations and he wanted them met," Black wrote. "This was a teacher's worst nightmare, to have the superintendent put the teacher in that position," one teacher is quoted as saying in the report. Teachers interviewed by Black said they feared retribution. The former superintendent's supporters say he helped generations of kids not only in sports, but with their academics and character. Sloan, a freshman at Syracuse on an athletic scholarship, said Cipp played a positive role in his life. Sloan has said that he boosted his marks through hard work. Bellport High Principal Bernard Soete and teacher Colleen Rafferty in specific instances. Briggs and Soete did not return calls Friday. Rafferty could not be reached for comment. The school board soon will determine the fates of others found to be involved in the grade-fixing incidents, Guercio said Thursday. who was tied to numerous other grade changes for the student. 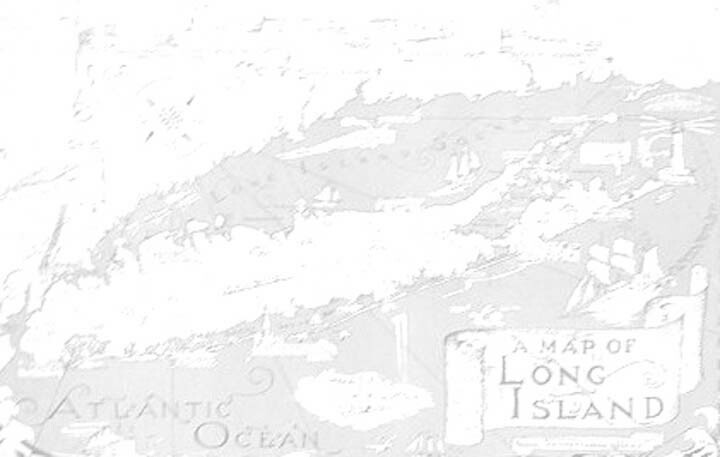 and changed to a 65 by Bellport High School principal Bernard Soete on June 23, 2011. Soete entered a 69 for Sloan’s fourth-quarter grade in intermediate algebra on June 16, 2011, and Rafferty changed it to a 77 six days later. he did not deny it, the report says. and removed the score on June 23. Black wrote that Rafferty said she did not know who removed the mark. “She denied making the change in removing the grade,” the report said. but will be paid more than a half-million dollars to do nothing for the next two years, officials said yesterday. 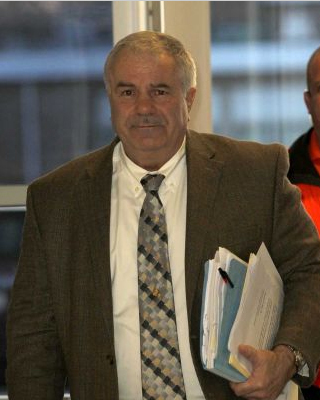 The stunning pay-not-to-stay deal given to South Country Central School District boss Joe Cipp Jr.
is the latest development in the sordid saga rocking the Suffolk County district. for pressuring staff to make sure student and football player Ryan Sloan got a scholarship to play at Syracuse University. The probe found that Sloan’s grades were improved at the behest of school administrators. in geometry, algebra, physical education and health, according to investigators. Cipp, 63, this week sent his written resignation, which the school board accepted 5-3 at a meeting Wednesday night. was ejected after an angry confrontation with a board member. when his employment contract expires — officials said. the remainder due him on his contract would have cost even more. Cipp’s lawyer, Richard Hamburger, said: “He did nothing wrong . . . He didn’t change any grades. He didn’t encourage anyone to change any grades. “He resigned because it was impossible for him to do his job,” Hamburger said. Cipp was the county’s winningest coach ever. Sloan, a Syracuse freshman, was on the football team last season but did not play. BELLPORT, N.Y. - (AP) -- A Long Island school superintendent accused in a grade-fixing scandal has resigned but will be paid more than $500,000 for the next two years. 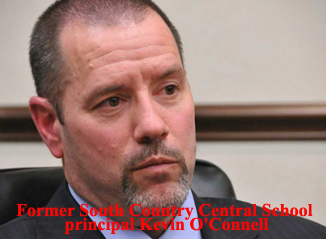 The South Country Central School District boss, Joe Cipp Jr., sent his resignation to the board this week. At a meeting Wednesday, the board approved the $545,000 package until 2004 when Cipp's employment contract expires. The school board president said the decision was reached because a legal challenge would have cost even more. An independent investigation found that Cipp, a former high school football coach, allegedly raised the grades of an athlete so he could get a college scholarship. The South Country School Board has not decided the fates of several employees that an independent investigation connected to an alleged grade-fixing scandal at Bellport High School, but will do so in the next several weeks, the district's attorney said Thursday. The board voted 5-3 Wednesday to accept the resignation of Superintendent Joseph Cipp Jr.
An attorney hired by the district to investigate the grade-tampering allegations involving a former football player found that Cipp must have been involved or must have known what was going on, according to a preliminary report. Cipp, 63, who has denied any wrongdoing, said Thursday it was in the best interest of the school and the community for him to step down. As part of the deal, which includes a cash payout of $545,000, he agreed not to sue the district. Referring to "the amount of pain and grief and suffering" he and his family have experienced, his decision to resign was a clear choice, Cipp said in a telephone interview. Before becoming superintendent in 2010, Cipp had been the high school's football coach for more than 30 years, compiling a record as the winningest football coach in Suffolk County history. One of Cipp's sons, Joseph Cipp III, 42, said Wednesday night that the accusations and their aftermath have taken a toll on his father's health. The elder Cipp Thursday would not elaborate, saying, "You can take it from my son. He wouldn't lie about my health." He had no further comment. Richard Hamburger, Cipp's attorney, said Cipp resigned because he couldn't be effective without board support. Hamburger said Cipp did nothing wrong but couldn't remain the focal point where "all the energy was directed in finger-pointing and blame." Cipp agreed to end his contract 14 months early and will forgo a significantly larger pension as a result. A new superintendent will take over Monday. "He didn't change grades," Hamburger said. "He didn't direct anyone to change grades." Cipp was accused by fired Bellport High Principal Kevin O'Connell of pressuring employees to boost Ryan Sloan's grades so he could qualify for an NCAA scholarship. Sloan received an athletic scholarship to Syracuse University, where he is a freshman and plays football. He has said he improved his grades at Bellport High through hard work. Sloan did not respond to a message Thursday. O'Connell has sued the district in State Supreme Court in Riverhead, alleging wrongful termination and seeking damages. O'Connell's attorney, Jack Grossman, said Cipp's resignation bolsters his client's case. "It adds credibility because they had an independent person examine all of the allegations my client made and then confirm them, putting pressure on for him to resign," Grossman said, referring to the investigation by Melville attorney Bronwyn Black. Sloan lived with Edward and Melissa Carson, a friend's parents, during his senior year. They served as his legal guardians and have been informing him about the case. "At this point in time right now, nothing has changed," Edward Carson said Thursday, adding that Sloan is still on the team. Syracuse spokeswoman Sue Edson said records are private and she could not comment. The NCAA, in a statement, said "we will not speculate on potential NCAA action." The long-running soap opera in the South Country Central School District has reached a major turn in the plot: the resignation of the embattled district superintendent, at a large cost to taxpayers. Unfortunately, though, the aftereffects of the struggle over allegations of grade tampering seem likely to drag on for a long time. In this ethnically and economically diverse district in southern Brookhaven Town, the school board is sharply divided. The superintendent is on his way out. The former high school principal is suing, claiming he was illegally fired. The athlete whose grades were allegedly altered, but says he improved them by hard work, has a cloud over his head. And what of the thousands of students who are the object of the whole enterprise? Has this bitter battle hampered the district's efforts to improve their schools? The interim superintendent, Howard Koenig, starts May 2. He must try to restore some peace and keep this woeful episode from hurting the students. That's a tall order, because he'll be reporting to a fragmented school board. The nine-member board acted correctly in taking the charges seriously and launching an investigation, but the process became terribly rancorous. Three board members issued an open letter calling on the board president and vice president to resign over their handling of the mess. Those two and four other board members signed a letter saying the open letter was unethical. So Koenig's job will definitely not be a walk in the park. The story broke in December: Kevin O'Connell, the former principal at Bellport High School, said he had lost his job for refusing to go along with pressure from above to raise -- or direct a teacher to raise -- the math grades of a football star, Ryan Sloan, so he could get an athletic scholarship to Syracuse University. O'Connell accused Joe Cipp Jr., the district superintendent and former football coach, who is a community legend for winning more football games than any other coach in Suffolk County history. Cipp denied the allegations and asked for an investigation by someone outside the district. 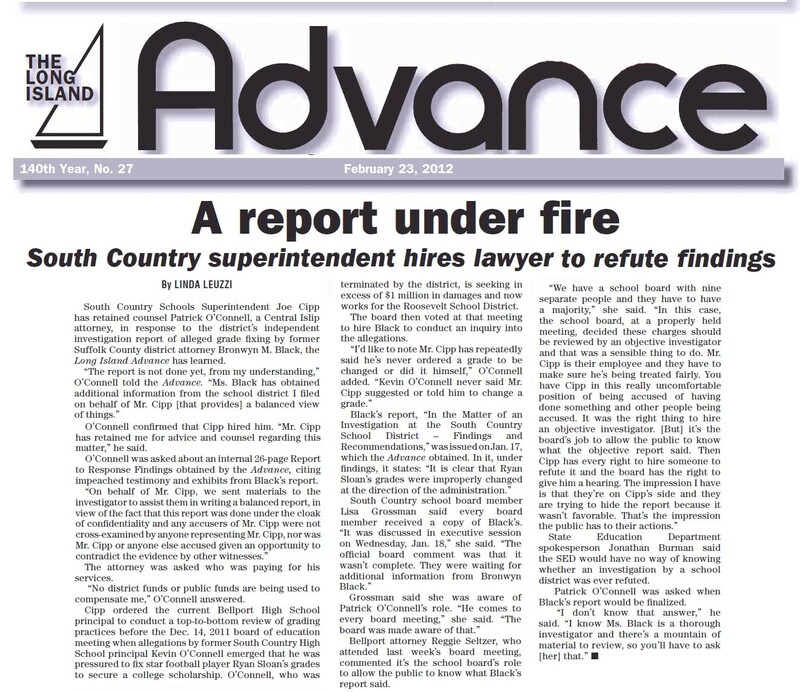 The school board quickly did the right thing in hiring a former Suffolk assistant district attorney, Bronwyn Black, to investigate. Last month, Black's preliminary report found that the grades had been improperly changed, and that Cipp "must have been involved or must have known what was going on." On Wednesday night, Cipp resigned, and the board voted 5-3 to accept. He'll get a lump-sum payment of more than $545,000 in salary alone. 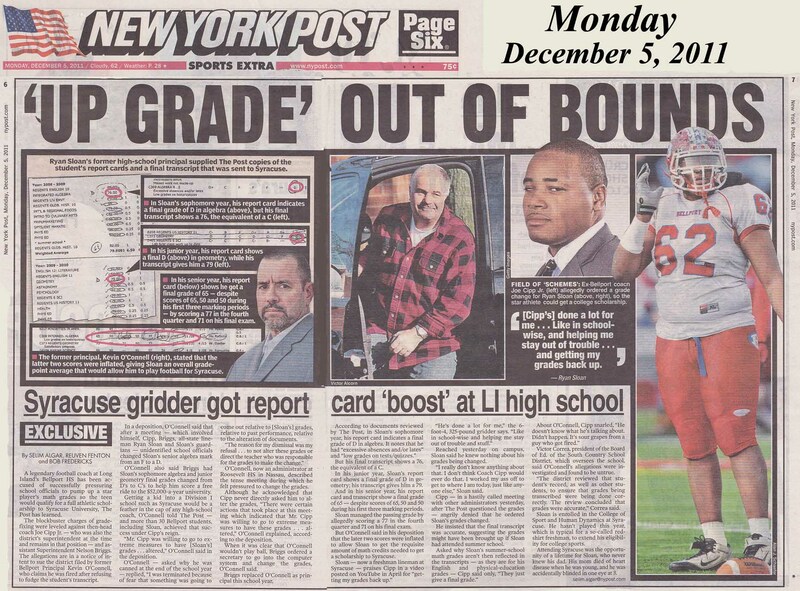 The controversy has been complicated, but the lessons are clear: If, in fact, the final verdict turns out to be that Sloan's grades were altered as alleged, the moral of the story is that no football scholarship is worth the disruption and destructive example that grade-altering sets. 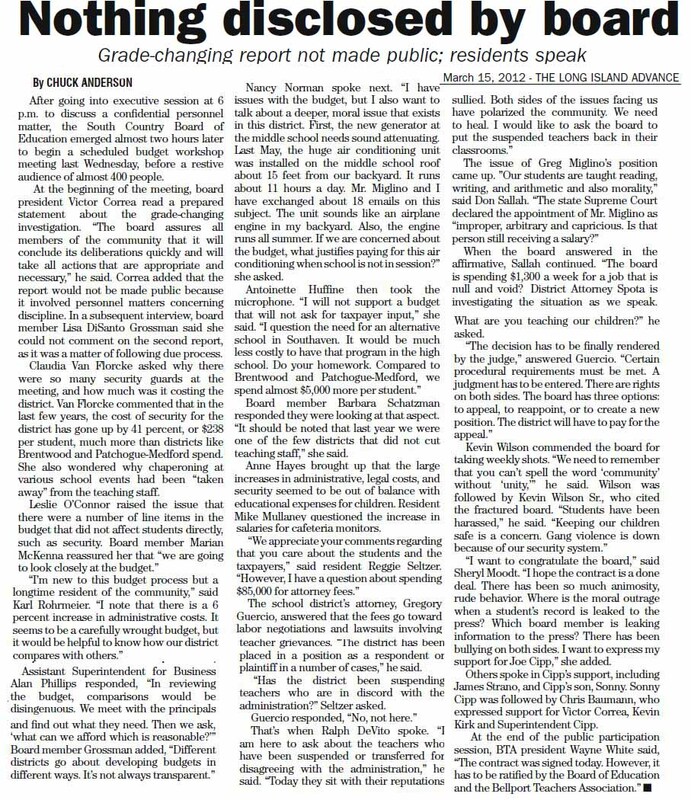 If Cipp did either direct or countenance grade-altering, he clearly let his long devotion to gridiron excellence weaken his judgment and entangle the whole district in a damaging controversy. Starting with a vote on three board seats in May, district residents will have a chance to shape the board that will work with the next permanent superintendent. We hope voters will choose wisely, balancing the emotions of the controversy against a calm determination to serve the most important people in this drama: the students. former superintendent of the Central Islip School District, who will serve in an interim role. I must take the appropriate action to put the focus back on our students and academics." Cipp's son, Joseph Cipp III, 42, who is head football coach at Bellport High School and was escorted from the auditorium. Under terms of his departure, the board will pay Cipp his $272,640-a-year salary through May 2, 2014, in a lump sum of $545,280. the cost of litigation to force him out would have been greater than $1 million. which he received from Syracuse University, where he is now a freshman. The superintendent has repeatedly said he never changed any student's grade or asked anyone else to do so. Cipp's son said his father was the victim of a witch hunt fueled by personal vendettas. and other infractions. "He's done that not to make them better players, but better men." He grew angry when a board member openly challenged his father's integrity and he shouted from the aisle. Correa asked him to be seated, but Cipp refused. Cipp was escorted from the auditorium by security officers at Correa's request. and said it had been difficult to reach a resolution. Money was a key factor, he said. “It all boils down to what we can afford to do and what we can’t afford to do,” school board member Owen Durney said. he district hired him as superintendent. in the post for five years, he would collect a pension of up to 80 percent of his superintendent's salary, the source said. Under Wednesday night's deal, he won't reach that threshold. for them to disclose the subject. When the board voted, there was both applause and boos from the audience. ound Sloan's grades were changed "at the direction of the administration." physical education and health grades were boosted. In that report, Black said Cipp "created an atmosphere of pressure . . . to make sure Ryan Sloan got the NCAA scholarship. he should have taken every step to prevent the actions that were taken,” she wrote. played any role in the alleged grade-changing. Earlier this month, school board members received Black's final report, but it has not been released. Black has not returned calls. Parent Chrisanne Schwartz was not pleased with the vote. "He is a man that has done so much for the community," she said. East Patchogue resident Joe Farber, whose two adult children attended the district, agreed with the settlement. "He should have lost the job," he said. "He didn't tell the truth. We're just ignoring that." Student Michael Savino, 18, a Bellport High School senior, said Cipp had been his football coach and Sloan is a friend. He said he agreed with the board's decision. "It was fair, but they let him know that they're strict here." down the upcoming budget because of the controversy. misdirect their anger about this situation and take it out at the budget," he said. his two sons both have been leaders of the Clippers, with Joe Cipp III the current head coach. who earned a Division II football scholarship to LIU Post. "I moved here from Georgia ... and got into quite a bit of trouble. Coach Cipp took me aside and helped me straighten things out. He's a father figure to so many guys." when things don't go my way," he wrote. Joseph Cipp Jr.'s future, seeking to reach a decision in time for Wednesday night's public meeting, the district's lawyer said. win an NCAA scholarship. The school board, facing intense pressure from the community to resolve the case, has promised swift action. Board president Victor Correa said the situation is complex and that discussions will likely continue through Wednesday. regarding all avenues of closure. It has been extremely difficult to navigate considering the legal aspects related to this particular situation." rights with what is best for the district and its students. "That is what a lot of the discussion has been," Correa said. A preliminary report written by a hired investigator, Melville attorney Bronwyn Black, was leaked to the media in February. Black said Cipp must have been involved or must have known what was going on in relation to Ryan Sloan's grade changes. Cipp has repeatedly denied the allegations. Sloan, now a freshman at Syracuse University, has said he improved his grades through hard work. School board member Barbara Schatzman said Tuesday that this has been a difficult time for the district. "We are taking it very seriously and we are going to do what is best for the district, the community and the students," she said. "It's not easy. It's a lengthy process and it's a serious issue." Schatzman would not elaborate on where the board stands regarding Cipp's future employment. The superintendent's personal attorney, Richard Hamburger, would not answer questions and Cipp declined to comment. Cipp was Bellport's football coach for 32 years until retiring in 2011 and became superintendent in 2010. The winningest coach in Suffolk County history is a prominent if polarizing figure in the community. but announced no action in connection with grade-fixing allegations at Bellport High School. who are accused by a former principal of helping alter the grades of a star football player. controversy over Cipp, saying only that the board had discussed "a very important personnel matter"
and would have its regularly scheduled board meeting Wednesday. confidential report on the grade-fixing allegations. won an athletic scholarship last year to Syracuse University. "clear that Ryan Sloan's grades were improperly changed at the direction of the administration"
and that Cipp "must have been involved or must have known what was going on." have said the student athlete improved his math scores -- meeting NCAA standards -- through hard work. an independent investigation has found. Suffolk Assistant District Attorney Bronwyn Black found. play. Cipp is one of the most successful coaches in Suffolk County history. Nelson Briggs are also implicated. at Bellport High School after receiving a confidential report on the matter. that are appropriate and necessary," said Correa, reading from a prepared statement at the start of the board meeting. The report, which Correa said will not be made public because it involves personnel matters "involving discipline,"
allegations from former Bellport High School principal Kevin O'Connell, who said Superintendent Joseph Cipp Jr.
fired him after he refused to change star football player Ryan Sloan's grades so he could get an athletic scholarship. O'Connell, of Patchogue, has sued the district and is seeking unspecified damages. released. Black did not return calls for comment Wednesday. Black said her investigation showed that Cipp "must have been involved or must have known what was going on,"
and the superintendent "created an atmosphere of pressure" to qualify Sloan for a scholarship. independent report states there is no direct evidence that he told anyone to change grades or eradicate grades. where anyone could reasonably believe that I expected or wanted a student's grades to be changed." records that she was seeking. have said he improved his high school grades through hard work. Now, the real dean of discipline is on the case. last year, The Post has learned. District board members and teachers, sources said. The office would not comment on their probe. Cipp Jr., were implicated in a recent report issued by an independent investigator. the vice president to resign. have come under attack by trustees, Lisa Grossman, Rob Powell, and Jeanette Mistler,"
and overt violation of the Code of Ethics For Board of Education." wrote and sent to area media outlets early last week. grades last year to help him secure a scholarship. Ryan Sloan's grades so the student could get a scholarship to Syracuse University. "must have been involved or must have known what was going on." flatly denied when the letter was released last week. Correa declined to comment. The letter released Wednesday night also accused Grossman, Mistler and Powell of "grandstanding,"
kangaroo court in the media that has attempted to convict some us of withholding information," it read. "This is completely untrue." Joanne Long-Merrill, a resident for 25 years, gave the board a petition she said was signed by 119 people. It demanded the resignation of Correa and Kirk and the suspension of Cipp, as well as the ouster of building administrator Greg Miglino. Kirk told her that she does not know what she is talking about. "You have some nerve," he said before telling her to go back to her seat. Three members of the South Country Central School District board of education have called for the ouster of their own president and vice president after a preliminary report said Bellport High School officials inflated a football star's grades to help him gain a scholarship. The board members, Lisa DiSanto Grossman, Jeannette Mistler and Rob Powell, also demanded the suspension of district employees who are found to have played a role in the "grade changing scandal" in an open letter sent Tuesday to the rest of the nine-member board. "In order to restore true leadership to the South Country Central School District, we call upon both the board president and vice president to resign their positions," read the letter, written by Grossman on behalf of the other two members. "Both have failed to carry out their elected duties when they failed to reveal the initial allegations about grade changes to the entire board." Board president Victor Correa and vice president Kevin Kirk could not be reached for comment. The missive is the latest development in an alleged grade-fixing scandal that erupted after Kevin O'Connell of Patchogue claimed in a lawsuit that he was fired by Superintendent Joe Cipp Jr. from his position as principal of Bellport High School because he did not take steps to inflate Ryan Sloan's grades. Sloan, now a freshman at Syracuse University, has said he improved his grades on his own. 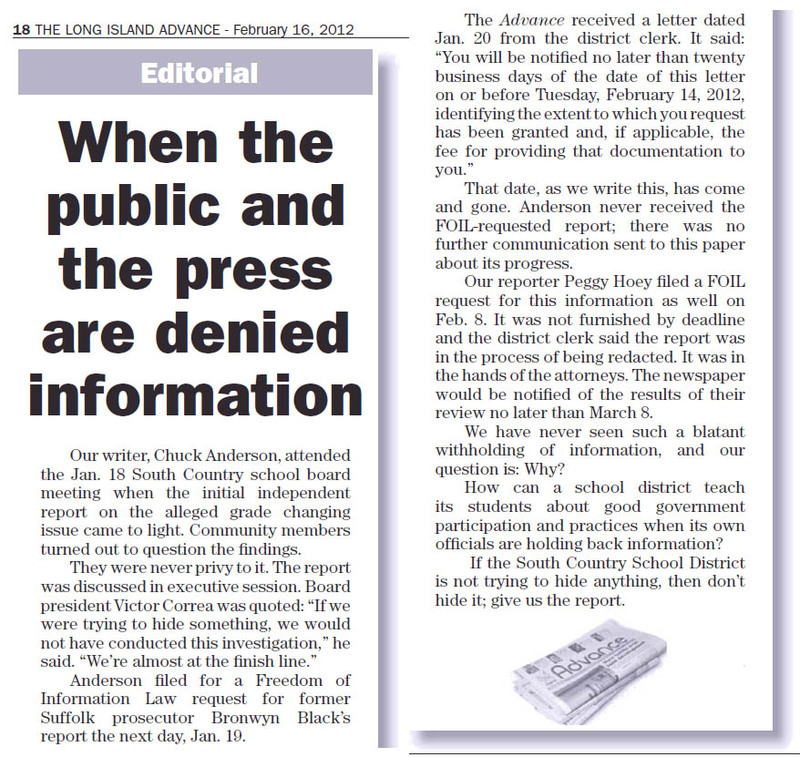 The letter was crafted as a plea "to every member of the board to move beyond personalities and preconceived notions so as to focus on what was, and is, in the best interest of all the children of our district." It cited specifically Correa and Kirk, asking them to step down, while declining to single out district employees for suspension. The letter also did not mention Cipp, the top administrator at the center of the scandal. It said Correa admitted that he "provided the confidential report to the subjects of the investigation prior to the contents being leaked to the press and disclosed to district residents." Neither district officials nor the attorney representing the district could be reached for comment. But the independent investigation into the matter preliminarily found that Cipp "must have been involved or must have known what was going on," adding that he "created an atmosphere of pressure upon the administration to make sure Ryan Sloan got the NCAA scholarship." The letter concludes, "We unequivocally believe that any position related to education is a sacred trust. 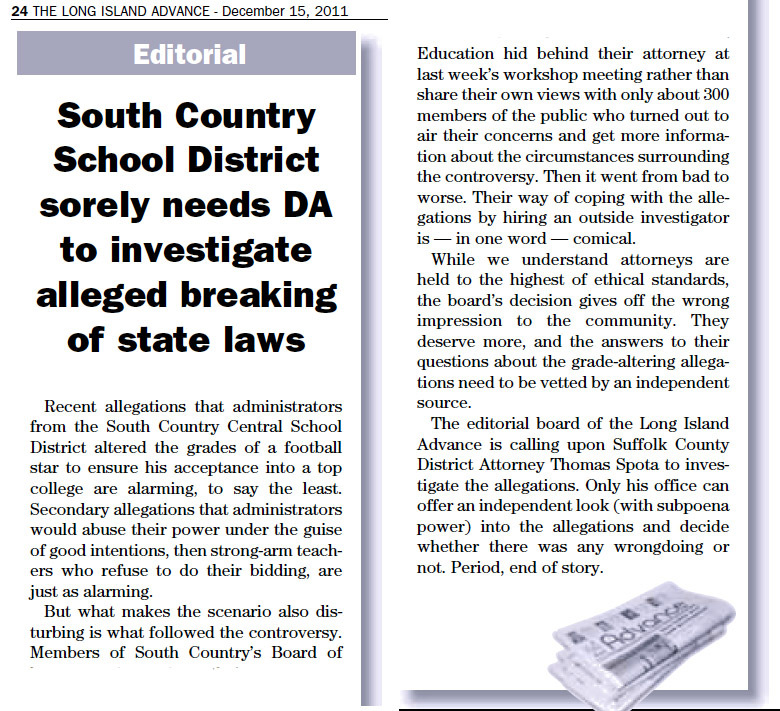 The current board majority and members of the school district administration have clearly broken that trust." Top brass at scandal-scarred Bellport High School and its district – where administrators allegedly changed the grades of a football player so that he could win a full scholarship to Syracuse – should immediately be suspended, three disgusted members of the South Country School District school board told The Post. 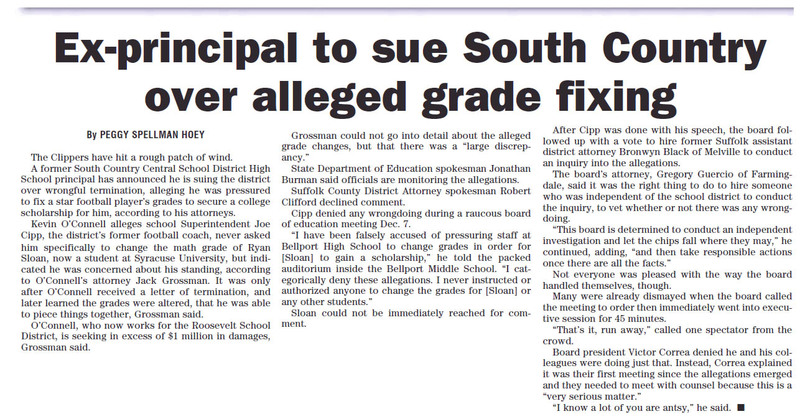 Administrators at Bellport High School -- including longtime coach and current superintendent Joe Cipp Jr. – were implicated in a recent independent report of inflating star gridder Ryan Sloan’s grades last year. After months of heated meetings, three formerly silent board members -- Rob Powell, Lisa Di Santo Grossman and Jeannette Mistler -- have written an open letter to the rest of the board demanding the suspensions or immediate resignation of school board president Victor Correa and Vice President Kevin Kirk. "It is well past the time to remove those in the positions of power who attempt to obscure the obvious truth by pointing fingers in all directions and feigning outrage," reads a copy of the letter obtained by the Post. "The only acceptable course of action is to suspend all district employees clearly implicated in the grade-changing scandal." 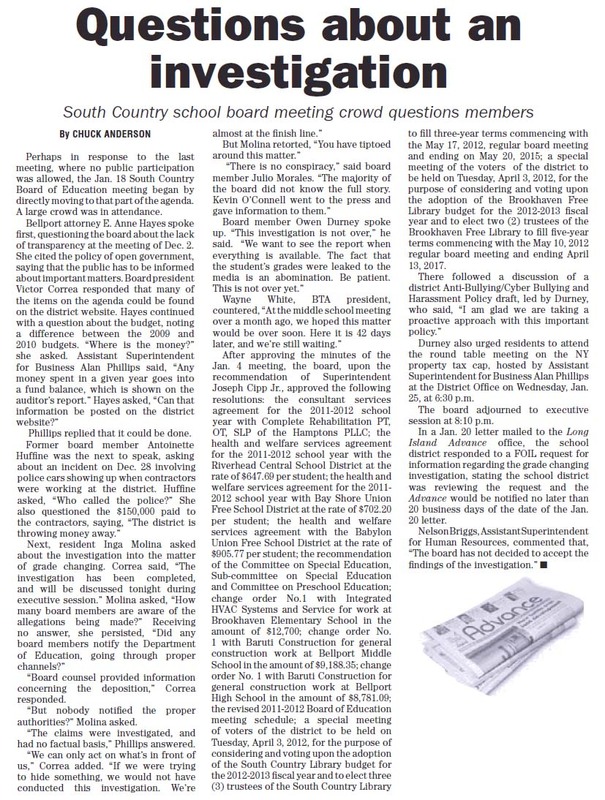 "Lastly, but certainly not least, in order to restore true leadership to the South Country School District we call upon the Board President and Vice President to resign their positions," the letter states. "Both have failed to carry out their elected duties when they failed to reveal the initial allegations about grade changes to the entire board." The comes after an independent investigation into the fixing accusations that found wrongdoing -- and asserted that Cipp Jr. must have been involved in the corruption. While the report is conclusive, Cipp's supporters on the board -- including current board president Correa, his former quarterback -- have labeled it a "preliminary" investigation whose results remain unclear. "That's just a stall tactic," said one board member. "They still think they can get away with this. It's incredible. The report couldn't be any clearer." The investigation revealed that administrators pressured teachers to inflate Sloan’s grades and revealed that potential whistleblowers were transferred from the school. Student transcripts obtained by The Post showed that a slew of Sloan' grades were hiked. Despite the mounting evidence against Cipp Jr., former Assistant Superintendent Nelson Briggs, and current Principal Bernie Soete, the trio has firmly denied any wrongdoing. that has engulfed Bellport High School told school officials Wednesday night to take action or step aside. "Our children are fighting in the hallways over this issue," Rocco DeVito, 52, a parent of two students in the district, told the board. "Without admitting guilt or feigning innocence, step down and let the healing process in this community begin. The division in this community must end." so that the student could get an athletic scholarship. Cipp, who sat with nine board members Wednesday night, has denied the allegations. I will state that I never changed a grade for a student or told anyone to change a grade. I will have more to say after I complete my own fact finding mission." The board hired an outside party to conduct an investigation of the claims. A preliminary report by a lawyer hired by the district indicated that Cipp "must have been involved or must have known what was going on." Board members say they are waiting for the final report before they take action. Several parents asked board members to resign. Board president Victor Correa asked residents to be patient. "We want to deal with this issue," he said. "Once that report is handed to us, this board will act." one in which he believes those who speak out are punished. He has two children there. Jeanne Rojas, 42, said she wants to see the school district's dignity restored. who lives in Bellport and has three children at South Country. Anne Hayes, 61, of Bellport, had two children pass through the district. She said she's concerned about the quality of education at South Country, particularly character education. "The adults here have failed to set a proper example for the students," she said. who may have been aware of or participated in the alleged grade fixing should be terminated. Sloan, the Syracuse University freshman at the center of the scandal, has said he improved his grades on his own through hard work. in order to make him eligible for an athletic scholarship to Syracuse University, according to a bombshell report obtained by The Post. "must have been involved or must have known what was going on," according to an investigator's preliminary report. principal Kevin O'Connell said he was let go for failing to raise the student's marks. O'Connell last month filed a wrongful termination suit against the district. "created an atmosphere of pressure upon the administration to make sure Ryan Sloan got the NCAA scholarship," the report said. Cipp, who retired as football coach last year, has repeatedly denied changing or authorizing a change to athlete Ryan Sloan's grades. The superintendent did not return calls Tuesday but issued a statement. "I am troubled by the unauthorized release of private information pertaining to district staff and students," he said in the statement. Scroll to the interview of Brentwood's former superintendent on Gov Cuomo's educational plan. Fast forward to 4 minutes and 15 seconds. Statement regarding the student grading investigation. for not taking steps to inflate a standout football player's grades. Ryan Sloan's grades so he could be eligible for a scholarship to Syracuse University or order the student's math teacher to do so.